Never stepped into a yarn shop, never bought an inch of yarn or a pattern, just too busy during the day sightseeing and too tired at night. Maybe next time? 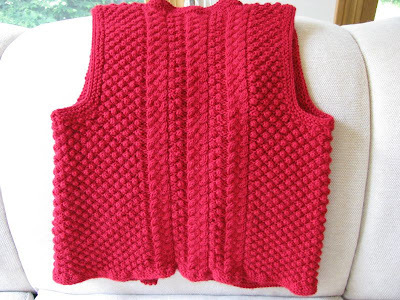 Finished the Trinity vest for mom. It's all washed, blocked on the wooly board and ready to give to her for fall. Decided to use Encore washable since it will need to go into a washing machine and dryer. Also will not put any buttons on it since those are hard for her to handle. This is just to be worn over a blouse. It was hard to block on the wooly board as the chest measurement is so small and I had to sew it together with cotton thread to keep it flat. Now back to working on Oregon second sleeve. 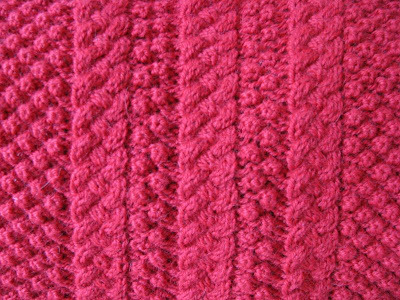 It was all picked up, decreases done and 15 rows knit when I realized I'd forgotten to turn the chart upside down. Since upside down trees wouldn't quite cut it, ripped it and now started over. I'll have to sit down in the next day or two and try to line up the fall and winter projects. What an attractive pattern. 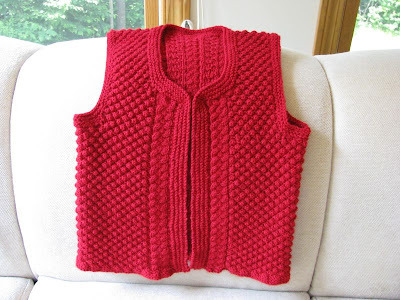 The vest looks warm and cozy, and the cheerful color is sure to put a smile on her face. Welcome home! We just got back from Maine. Unfortunately we were both in opposite places at the same time. I did get a chance to check out Halcyon when I was in Maine. I got a drop spindle and am in the process of making ugly yarn. Hopefully with practice . . . I love the texture. And the color is great. That is a terrific vest for your Mom. It looks so tiny. Pretty color and great yarn choice. I decided to keep all my 'good' wool for me. Very few know how to launder it. I have used Encore and Patons' 25/70 blend. Both are great and wash up beautifully. Martha will love the vest. Colour and texture excellent.Hard work but worth it.